If you think of front-engined Ferrari grand tourers, does your mind’s eye picture V12-powered Daytonas and 550 Maranellos, and your mind’s ear the quad-cam soundtrack to C’etait un Rendezvous? 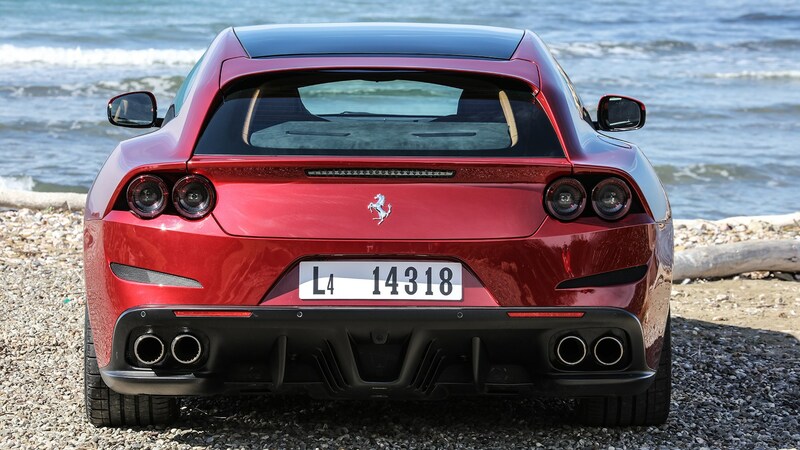 For some, a Ferrari GT by default should have two banks of six cylinders under its generously sized snout, but now Ferrari’s eccentric breadvan-styled four-seat GTC4 Lusso becomes even more unconventional – and conversely, more inclusive – with the addition of this new V8-engined GTC4 Lusso T entry model. No prizes for guessing what the T stands for – it’s driven by the same twin-turbocharged 3.9-litre V8 as the Ferrari 488 and California T. Said drive goes to the rear wheels only, as the Lusso T does away with the complex all-wheel-drive system that’s a core feature of the V12 GTC4 Lusso. If the GTC4 Lusso T isn’t four-wheel-drive, what does the ‘4’ in the name mean? 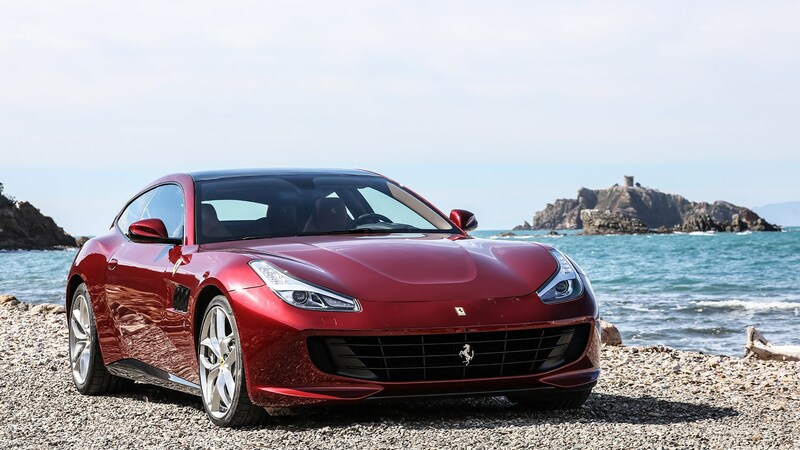 Midway through 2016, the four-seat, all-wheel-drive V12 Ferrari FF was superseded by the GTC4 Lusso (or GTC4Lusso if you follow Ferrari’s spacebar-phobic naming convention), with a comprehensively restyled body and enough changes within it, including four-wheel steering, to warrant an entire name change. 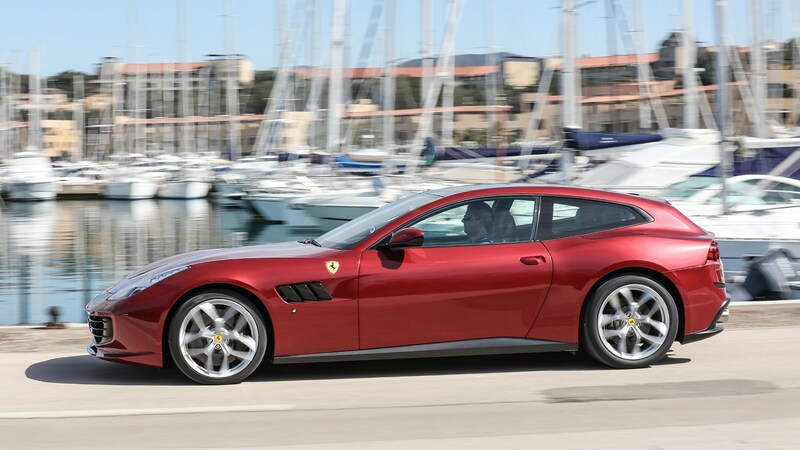 Now there’s this turbocharged V8 version, the GTC4 Lusso T – although Ferrari would have it that its character is so different from the V12 that it should be thought of as a separate model altogether rather than a variant. Fundamentally, though, it’s the same machine at its core. What’s the story behind the Ferrari GTC4 Lusso T? Ferrari tells us the Lusso T has come about entirely as a result of customer feedback. The FF brought a different, wider-ranging group of customers to Maranello, with a younger average age. Within this wider group, it’s found a younger-still sub-sect (think 35 to 40, rather than the traditional 50+ Ferrari demographic) who would prefer to travel further between fuel stops, rarely drive in areas with low-grip conditions and thus don’t need or want all-wheel-drive, and would like a more involving, neutral handling balance – albeit one still geared towards comfort. They’re more likely to drive their Ferrari daily, predominantly in urban areas, and they regularly carry passengers. With that in mind, there’s a sound business case for transplanting the talented turbo’d V8 from the 488 and California T – especially for markets such as China, where heavy tax penalties for engines in excess of four litres can hugely inflate the V12 GTC4’s list price. Browse our Ferrari for sale listings. What about the plain, T-less V12 GTC4 Lusso? Will that continue as before? That carries on unchanged, with the same 680bhp, 514lb ft 6.3-litre V12 and all-wheel-drive system. The Lusso T carries some inherent advantages over its bigger-hearted brother, with more easily accessible low- to mid-range torque, and lighter overall weight – although only by around 55kg. Blame the turbocharged engine’s extra ancillaries, plumbing and fluids. More pertinently, weight distribution shifts further to the rear, with a front:back split of 46:54. That’s enabled faster steering response, less understeer and reduced body roll, with the standard-fit four-wheel steering system helping to make the car less nervous at the limit than it would be otherwise – in theory, the best of both worlds. 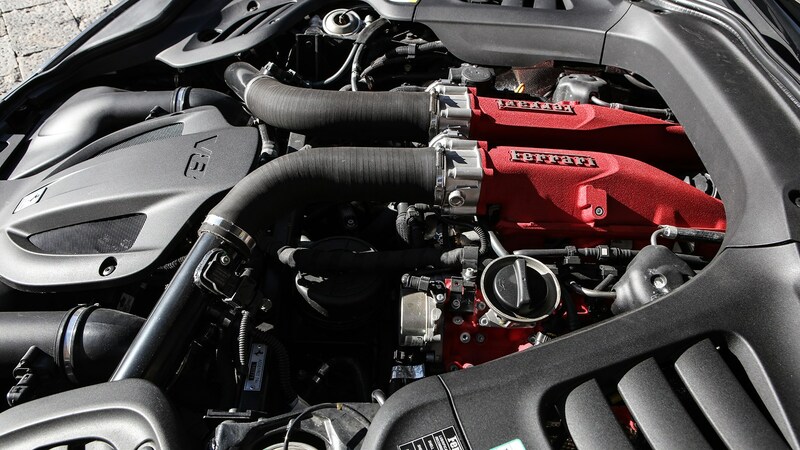 Are there many differences between the V8 engine in the Lusso T and the one in the Ferrari 488 or Cali T? New copper-alloyed con-rods and pistons, with twin cooling oil jets, a redesigned intercooler, a new intake system and a bigger-bore, differently arranged exhaust layout which coils its manifold runners into equal lengths for the best possible response and a fruitier sound. Compared with the more frenetic 488, it’s been tuned for reduced NVH and lower overall noise levels. With the same 91-litre fuel tank as the V12 Lusso, mileage from a full brim increases by around 30% thanks to the combined reduction in thirst from the smaller engine and drive-less front axle. And during our lengthy test, over a variety of roads and speeds, the fuel gauge dropped encouragingly slowly (for a Ferrari). 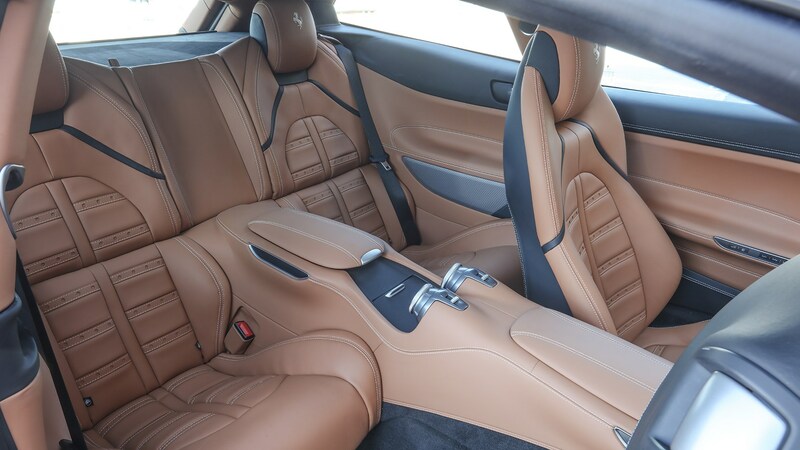 How does the Ferrari GTC4 Lusso T feel to drive? Big. This is a very long, very wide car (although one that’s surprisingly easy to manoeuvre in town) and it takes a while to shrink around you on the move. But when it does, it’s spectacularly good to drive. As on the V12 GTC4 Lusso, Magnaride adaptive dampers are standard, and they deal with large bumps and mid-corner surface changes with almost spooky ease. It’s not quite so good at insulating smaller surface imperfections, most likely a function of the 20in wheels, but body control is impeccable. As is the wont of modern-era Ferraris, the steering is very fast, but not quite as ultra-sensitive as the 488's helm. It’s a well-resolved set-up in the GTC4, reassuringly un-flighty at the straight-ahead for motorway work, but a quick flex of your palms is all it takes to introduce the car to a corner and it’s remarkably stable once loaded up. Likewise front-end grip. I’ve driven few cars with such a positive front end, so responsive and grippy as to feel like a slot car guide connected to the tarmac. The 4WS rear-wheel steering undoubtedly helps in this regard. In fast corners it swivels the rear wheels in the same direction as the fronts to effectively lengthen the (already enormous) wheelbase, and while you can’t feel it in action overtly, there’s an innate, reassuring stability in the corner entry phase. And on corner exit there’s enormous traction, even with the ESC system turned off. Incidentally, and frustratingly, there are no halfway steps between Sport and you’re-on-your-own-now-mate ESC Off modes, as there are in the 488 and F12. At lower speeds, where the rear wheels steer in the opposite direction to the fronts, the effects of the rear-steer system are more noticeable. In roundabouts, for instance, you might find yourself using less lock than you’d expect, and on the entry to the many hairpins on our rural Tuscan test route, the GTC4’s turn-in agility belies the car’s size. There’s great feel from the standard-fit ceramic brakes, powerful and easy to modulate, if a little distant from cold. There’s no getting away from the sheer masses involved, though – at 1865kg the GTC4 T is still a very heavy car, and while it handles beautifully for such a big vehicle, you’re always conscious of its bulk. Even Ferrari personnel willingly acknowledge the 6.3 V12 makes a more charismatic sound, but they’re proud of the work they’ve done to make the V8 far more tuneful than most turbos. An electronically controlled bypass valve helps the Lusso T avoid being antisocial on start-up and when driven in urban environs, and opens fully in Sport mode. It’s a quieter and, subjectively, more guttural sounding engine than in the 488, and its relatively low voice sometimes makes it feel as if you’re going slower than you really are. The seven-speed dual-clutch gearbox is keen to get to top gear as soon as possible in auto mode, and can be slow to change down. The large, column-mounted paddles shift gears about as fast as you can think in manual mode, however, and won’t veto downshifts from high revs. How practical is the Ferrari GTC4 Lusso T? A stepped area within the boot to accommodate the rear suspension and fuel tank pinches luggage space, but you’ll still get three to four decent-sized suitcases in there. Rear passenger space is genuinely capacious for those under 6ft 1in or so, with plenty of legroom and genuinely comfortable seats with better lower back support than most. There are only two doors, but the huge wheelbase makes clambering in and out an easier process than a typical three-door family car, with the low roofline less of an issue than you might expect. Refinement in terms of wind and road noise impresses; which makes the noisy air-con and loud seat motors all the more noticeable, if we’re being picky. It’s a curious proposition, the Lusso T. It’s arguably a better car than the V12: just as fast if not faster in the real world (provided it’s not snowing), with a sweeter handling balance and more useful range from a tank fuel. The GTC4 is an unorthodox, rare-groove kind of Ferrari, with four seats, an XL wheelbase and styling like a shark that’s swallowed a Reliant Scimitar. If you can afford it or justify it, speccing it with an enormous naturally aspirated V12 and a wilfully complicated all-wheel-drive system somehow feels more fitting. But if not, the Lusso T is a deeply impressive car with rewarding, physics-defying dynamics, genuine practicality and an appeal of its own.